Apparently, it sounded a pre-planned attack that only an investigation can rule out. For Engineer Rashid, the Langate lawmaker for the seventh year now, October 8, 2015 would always remain important. 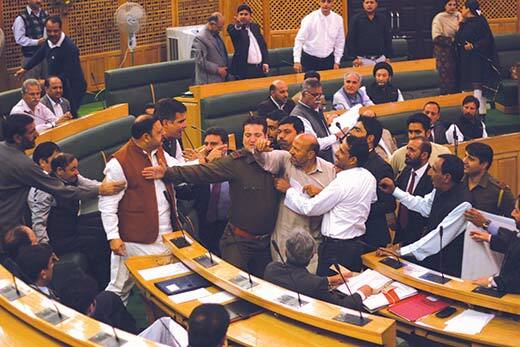 Being marshaled out of the house is nothing new for this restive, frail and noisy MLA but surviving a physical assault in the legislative assembly is something unprecedented, both for him and the house. “They wanted to strangulate me as they caught me by my throat,” Rashid said. “Had the NC MLAs not come to my rescue immediately, late by even a minute might have made me another human being to be lynched to death for cow slaughter.” As NC retrieved a shattered and frightened Rashid and took him aside, another BJP lawmaker was waiting. He caught him too. But in the process was slapped by angry Rashid. It was just a two-minute affair. Engineer entered the house, had barely shaken hands with a few of his NC counterparts while on his way to his seat that BJP’s Ravinder Raina intercepted him. Soon, another joined and the sudden assault pinned him down in the leg-space of the semi-circular middle row seating of the house, in the midst of the opposition benches. Shock took over the house. NC, Congress and all independents were on their legs shouting shame at the Speaker Kavinder Gupta, the self-stated proud RSS man, as he took his seat. Ruling PDP fled the house, for the moment. Then, another drama took over. NC president Omar Abdullah regretted the hooliganism and linked the assault to Dadhri, where a Muslim was lynched for suspicion that he had eaten beef, while asking Chief Minister to explain the unprecedented. Mufti condemned the attack and asked his Deputy, Dr Nirmal Singh, to condemn. He condemned it twice but did not apologize for the conduct of his members, even though both, the Chief Minister and his predecessor, insisted for it. Result: opposition walked out. Gupta who had suspended two NC lawmakers from the house for their conduct skipped the touchy issue altogether. Action demanded but not heeded! 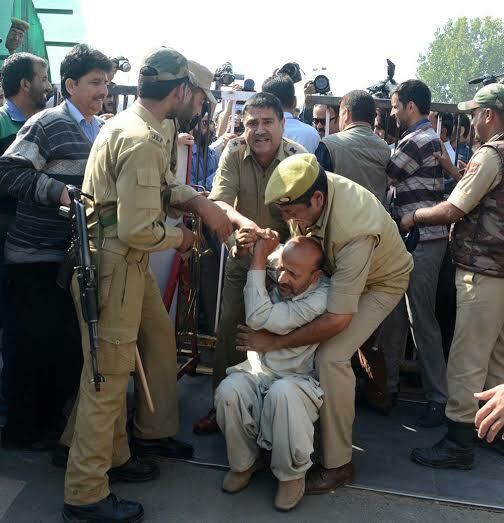 Spillover of the tension was clear in the House of Elders where BJP demanded action against Engineer Rashid for his ‘beef party’, the bedrock of the crisis. NC wanted to discuss the happenings. In a surcharged house Law Minister Basharat Bukhari gave vent to PDP’s dilemma. “We cannot be taken for a ride,” he shouted. “I am a Muslim and do practice what is allowed under Sharia including having beef, and nobody can stop me from doing so.” Somehow the routine resumed after a series of verbal duels and was less noisy. An hour later, the house was in full quorum and the lawmakers were discussing issues of their concern. NC lawmakers Ali Mohammad Sagar and M Akbar Lone pointed towards the paucity of time, read from the rule book, suggesting extension of the sitting so a score odd private member bills listed for the day are taken up after an abnormally huge seven call attentions conclude. Bills included two pieces from Communist leader Yousuf Tarigami and NC’s Sagar, Lone and Mian Altaf seeking amendment in particular sections of the Ranbir Penal Code that penalizes the cow slaughter. Bills were taken up. At the introduction stage, the first was discussed and Speaker Gupta adjourned the house for the day. A bout of noise and it was over. Ruling coalition did not want the touchy issue to be discussed by the lawmakers! Rather, who has been a Speaker as well, said till 1977 there was no scope of any tensions because it was one-party rule. The real assembly, he said, started after 1977. “Even when I was Speaker, the opposition was sizable, around 30 members but there was not an instance like this,” he said. Two top officials associated with state’s legislative set-up in the state for more than three decades said this was unprecedented. “Earlier worst was physical abuse and the latest on that front was when the then Speaker Akbar Lone picked a battle with Molvi Ansari and Ms Mufti,” one official said. “But we have never witnessed such a worst scene in which a lawmaker is literally ambushed.” Interestingly, that brawl made Lone “famous” for his finger. Thursday’s ‘house collapse’ was waiting to happen for many days now. A right-wing lawyer filed a PIL before the High Court seeking implementation of the RPC that prevents bovine slaughter. By the time, the High Court in Jammu issued a direction; the applicant was an additional advocate general. A similar PIL in Srinagar seeking deletion of the particular section led to issuance of a separate direction asking the state government to explain and, if required, legislate on the issue. With the brief autumn session already announced, the north-pole-south-pole coalition saw a trap in waiting. It was and continues to be unwilling to take a stand on it. With two directions in hand, it went to the Supreme Court and sought a third opinion. The Supreme Court stayed the High Court Jammu’s order for two months and asked the Chief Justice to set up a 3-member bench to decide on the issue. PDP insiders were excited that Jammu bench’s order was stayed for two months which essentially suggests there is no bar either on bovine slaughter or beef consumption. This, they admit, was a huge relief at a time when everybody was trying to corner the ruling party. The argument was that since the case is pending adjudication at the highest court of the land, the issue cannot be touched. Punitive sections in RPC were always there but it never prevented the consumption of beef in Muslim majority areas. The overdose of right-wing activism sharpened the divide and brought the entire mess in the public discourse. Unlike Congress, NC took up the issue and all others outside the ruling coalition followed it up. Engineer Rashid, perhaps been the most newsy lawmaker, could not resist the idea. He butchered a cow in home constituency and then toured the sensitive areas of Jammu but was prevented from repeating the same. From day one of the ongoing session, he never permitted the cow to actually go grazing. On Wednesday evening, he hosted a “beef party” in the lawns of the MLA hostel. But that did not prevent BJP lawmakers from not addressing their constituency. Ravinder Raina, BJP’s Nowshehra lawmaker said the assault would have taken place in the MLA hostel, which, he insisted, was raided by six party MLAs as the ‘beef party’ news broke. “By then, he had fled,” Raina said. “We consider cow as our Mata and we will never permit our mother to be butchered and eaten.” An alternative report suggests that six of BJP legislators confronted Rashid and party during ‘beef party’ turning tables upside down and Langate legislator fleeing leaving guests in lurch. Raina, however, had no explanation over why the party did not register an FIR as law abiding citizens? How can a lawyer and a lawmaker mount a physical attack when he is part of the all-powerful government, is another question that will always be raised but never answered. The attack has linked contemporary Kashmir’s cow debate with its almost-forgotten past. Then, cow slaughter – even for helping women and children to survive state-enforced hunger, would lead to butcher’s roasting alive in cow dung with the beef consumers. Bovine slaughter in Kashmir is more of a psychological issue rooted in history than the routine protein-consumption and cheap-meat debate. Rightwing activism has actually rediscovered the debate for Kashmir which has the potential of pushing even the moderates and the unionists to think on communal and separatist lines. 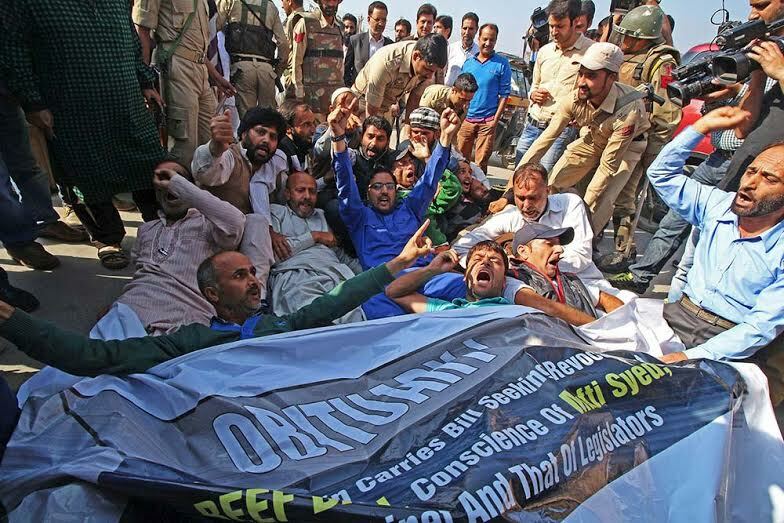 While insiders in the unionist camp believe this is being done to prevent its slide in its core vote bank, the cow debate is potent enough to strain Kashmir’s patience at a time when it is fighting a volatile economic slowdown dictated by September 2014 floods. Thursday assault was unprecedented but was in continuation of the tune that lawmakers set for the session from day 2. On Monday, the opposition did not permit any smooth business despite three adjournments. NC, Congress, Engineer Rashid were actually in the well, every time the call bell from secretary’s table rang up to announce resumption of the house. 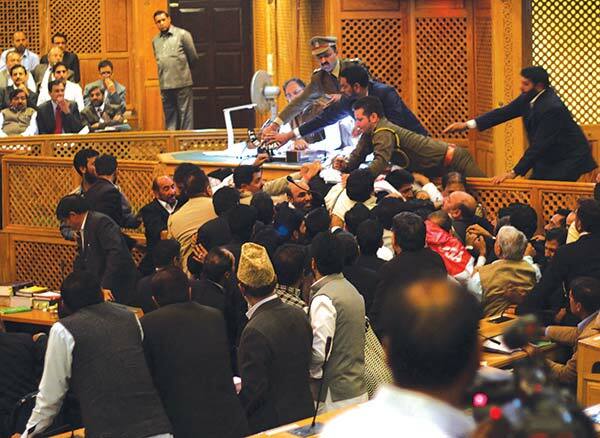 Tuesday witnessed the worst as NC literally unleashed its three newcomers Altaf Kaloo, Abdul Majid and Ishfaq Jabbar on the house. Wearing the red plastic banners, they flew over the benches like monkeys and borrowed their way through the leg spaces of the crowd to turn tables. They did not permit any business till Gupta marshaled two of them out and suspended them for the rest of the session. NC stayed out in protest creating a situation that other independents and even the Chief Minister sought its revocation. For Wednesday, the house functioned without NC. As Omar returned to the house on Thursday, his arrival coincided with Rashid assault! From Day 1, the session seemed a sort of fixed match. On Monday when aggressive opposition lawmakers did not permit any business, treasury benches were happy: “No time spared for a question to be answered”. Ruling coalition was not unhappy over this. Second day was much worst as agitating lawmakers even snatched mikes from ministers to make their point. What could have happened had there been a smooth sailing of the house was seen on Wednesday when NC stayed away. BJP lawmakers embarrassed their own government by cornering the Jr Education Minister Priya Sethi. They said their minister has got officers who have literally destroyed the education sector in Jammu. They cited instances. A shocked Sethi actually left the house and returned only after Chief Minister had personally tackled the issue and made promises. Even its own ministers like Lal Singh attacked the government! But this brief session, apparently aimed at playing to the galleries, posed more questions than it solved. Firstly, why should lawmakers gang-up against each other? If they have issues, they have recourse to everything including lawmaking. Why did not BJP register an FIR, and if it did, why did not it made its government to act? Secondly, what is the message that BJP intended to put across Kashmir by mounting an attack on Rashid? Why physical assault when other options were available? Thirdly, when Chief Minister Mufti Sayeed condemned the attack, why didn’t he moot the idea of placing the two BJP lawmakers under suspension for the day? Even the house demanded it. Why did he ask his Deputy Dr Nirmal Singh to apologize, who did not accede to his request? As leader of the government, was Chief Minister Mufti Sayeed lacking mandate to act against a few members who proved to be hooligans? Fourthly, if assembly is the temple of democracy having elected leaders from a cross section of the heterogeneous J&K, why cannot they discuss issues which are being used to divide a society? And finally, if lawmakers cannot debate crucial issue in assembly that has representative character, should the issues be tackled by crowds on the road? Where is ‘the battle of ideas’, even lawmakers were heard shouting in the din that dominated the assembly. In his earlier tenure as Chief Minister, Mufti presided over a marathon discussion on the state subject law in the legislative council on March 11, 2004 when it triggered regional fissures. His then ally, Congress was on the other side of the discourse. But the Chief Minister ensured a debate on the subject that continued past midnight, almost for six hours. The outcome was not unexpected but, at least, the issue was debated. After this incident, Rashid asserted that “two nation theory was proved right”. Nothing of that sort was even thought in beef case. The impact reflected the day after the beef bill was consigned to the dust bin. 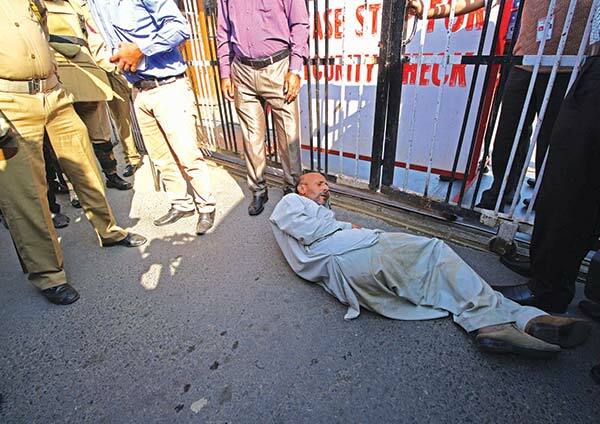 Engineer Rashid drove his supporters to the city and enforced a literal no-entry on the secretariat till police marshaled him and his supporters away to the lock up. Why is the government deliberately throwing the issues to the road so that crowds follow it up and create situation that impede growth. 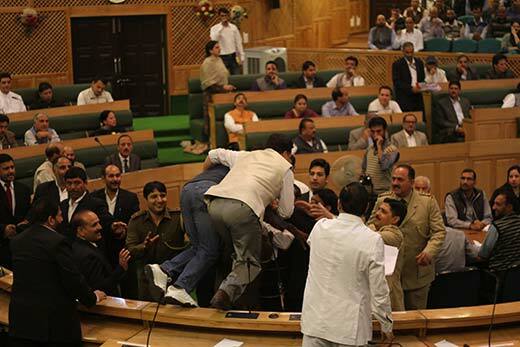 Tremors of the happenings in the assembly were felt in Jammu. Discovery of carcasses near Chenani led to protests and blockade of the highway. A day later, two more districts were involved. Officials say the autopsy has proved the animals had died a natural death. But who cares? But the Friday sitting was exemplary. No noises, no pandemonium. Not a single word on beef. Nobody talked about the proposed bill, not even in whispers. House was normal. Omar talked about tourist facilities in Tosa Maidan and his successor Chief Minister was all praise for his concern. Half an hour later, Omar moved a resolution expressing concern over the situation in the state. He wanted the entire house to support him in condemning the religious extremism and reiterate J&K’s commitment to secularism. Chief Minister Mufti Sayeed made an impressive speech listing how Sheikh Abdullah converted Muslim Conference into National Conference for the sake of secularism. A few minutes later the house adopted it. BJP committed itself to secularism while jumping into the resolution that could otherwise pass, even without them. As the sub-continent is debating food menu, Kashmir is making global headlines, agian, albiet for beef reasons now. It is good that sanity is prevailing in the house. Lawmakers should have avoided raising the pitch if they were aware of the limitations they usually face. Was it the impact of the vegetarian dinner that BJP Deputy Chief Minister Dr Nirmal Singh hosted for his party and PDP president graced the occasion? Or were there other forces at work. It may never be revealed. Chief Minister Mufti Sayeed was correct when he told a Delhi newspaper: “The issue will soon die down”. In Kashmir debates always die but scars remain.